None of the insects pictured in this post are bees, although they could all easily be mistaken for bees. The first picture is of the rather uncommon Soldier Fly (Stratiomyidae), the Long-horned General. In Britain this species is generally only encountered on coastal sites with brackish ditches, but it is not so restricted in Europe. This female was taken at la réserve naturelle de la Chérine in la Brenne. I think it may have been fairly newly emerged. In any event, it was astonishingly bee-like in appearance as it ponderously clambered up this grass stalk, with its long antennae and folded wings. It was the spindly legs, quite unlike the robust flattened legs of a pollen collector, that gave this one away as not a bee when I first looked at it. 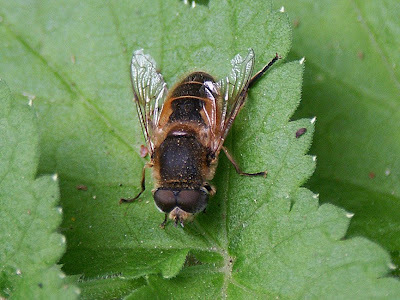 The next picture is of the Hover Fly (Syrphidae) Eristalis arbustorum - very easy to mistake for a bee when you see them working over a flower bed, especially as they even buzz like a bee. This one is an old and battered male, taken in May near Bossay sur Claise. The species has two generations a year and this one is from the first generation, which are usually darker and 'furrier'. The second generation are glossier and often have fine white edges to their tergites (the segmented chitinous abdominal exoskeleton). In this photo you can also see that the eyes are hairy - a feature of many flies - the hairs sit between the individual ommatidia of the compound eyes and prevent the eyes being smeared with pollen. When you see a fly wiping its eyes with a leg, it is using the bristles on the leg to comb pollen and other detritus out of the hair on its eyes. 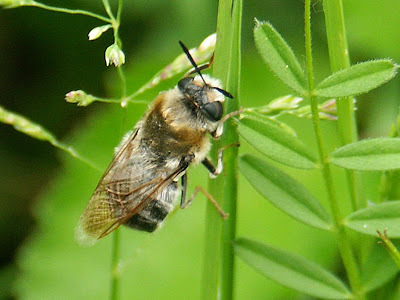 Next we have the Bee Fly (Bombylidae), Hemipenthes morio. 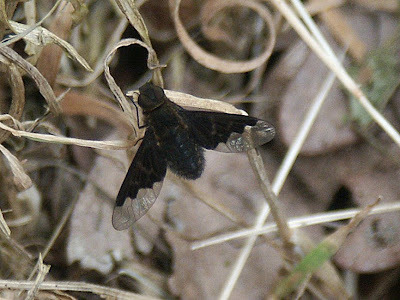 These appear to be made of black velvet and are one of the few Bee Fly species that can be confidently indentified to species level in the field with a little practice. Nothing else has this very neat zig-zag division of light and dark on the wing (but beware other Hemipenthes spp and Anthrax spp which also have patterned wings). Hemipenthes spp are hyperparasites - in other words, parasites of parasites - in this case of Tachinids. My French field guide describes H morio as 'corps sombre, à écailles et poils foncés. Aire basale des ailes noire, motif en escalier vers la partie distale, r1 transparente à l'extrémité' (dark body, with dark scales and hairs. Basal surface of the wings black, forming a stepped pattern towards the distal part, the first radial vein transparent at the tip). It goes on to give a size range of 5-14mm (this rather large size range is very common in parasitic flies - size depends on the nutrition available in the prey, and male flies of most species, whether parasitic or not, are significantly smaller than females). One of the things that gives this fly away as not a bee is that it is sitting in this charactistic 'stealth bomber' position with wings outstretched, rather than folded over the body like the Soldier Fly above. I am particularly fond of this family of flies and have happy memories of watching various species on locations as far apart as my garden near London and on the roadside in the desert travelling between Alice Springs and Darwin. 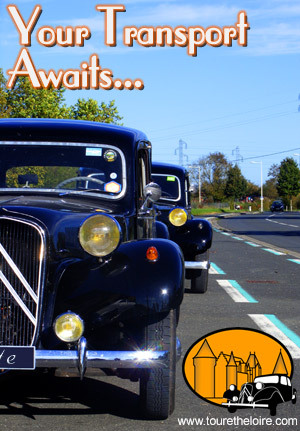 This one was photographed near the Maison du Parc in la Brenne. Long-horned General - this is a relatively recent name, allocated by Alan Stubbs when he was writing the monograph on British Soldierflies and their Allies. It was felt that all species described should have nice accessible English names, and as the Stratiomyidae family were already known as Soldier Flies, they were each allocated a rank. Being a General indicates a big fly. Stratiomys longicornis - 'stratiomys' = 'spread body' (a reference to the dorsally flattened body common to many Stratiomyidae); 'longicornis' = 'long-horned' (a reference to the long antennae). Eristalis arbustorum - 'eristalis' means something like 'very troublesome'; 'arbustorum' = 'of the bushes'. L'Eristale des arbustes - 'bush drone fly'. Hemipenthes morio - 'half-mourning clown'. Great post, as usual. And it is unusual at the same time. As most people, I'd have thought these charming creatures were bees. Sumptuous photos! I love the "clown en demi-deuil." It's a curious name, isn't it? Morio is the specific name of quite a few insects. The thing they seem to have in common is that they are velvety dark. There must be some connection between this colouration and the buffoon Morio, but I don't know what it is. The French name for the Marbled White Butterfly (Melanargia galathea)is Demi-Deuil, btw, but the effect is of a white butterfly with a black pattern. The scientist describing the species presumably didn't make the connection, so the scientific name does not include 'hemipenthes' and does not make the same reference to mourning, only to the fact that it is black and white. For a pic see my previous post http://daysontheclaise.blogspot.com/2007/10/les-papillons-de-jour.html.